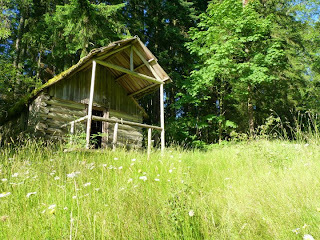 This trappers cabin was brought to the BC Forest Discovery Centre from Wild Deer Lake, about 40 kms southwest of Duncan. It is a simple, one-room home, with a bed frame and meager kitchen area. The small porch would have allowed a lazy evening for the weary trapper after a long days hike on the trap lines. Although the cabin was built for trappers, it was primarily used by timber cruisers. These men traveled into the forests and measured the amount of timber available for logging operations. At the original site where this cabin was located there were also two other cabins, though they were destroyed. The name apparently has no significance, but evokes a nostalgic feeling of the simple days past. The Lily of the Valley Cabin, is located on the Centre's lower grounds, next to the waterwheel display! It offers a view of the train on the trestle over Somenos Lake as well. You can reach it by the trail behind the playground area, or the road access from the Drinkwater Station area.